Mike Chiappetta sent us a photo of his costume for the Playa this year, and what do you want to bet that it might come out for Halloween too? He used 3 drivers – 1) the face is on a hat as a seperate driver, 2) the heart beats on and off as a seperate driver and 3) the body uses a “Big Boy” driver for the chest, arms and legs. 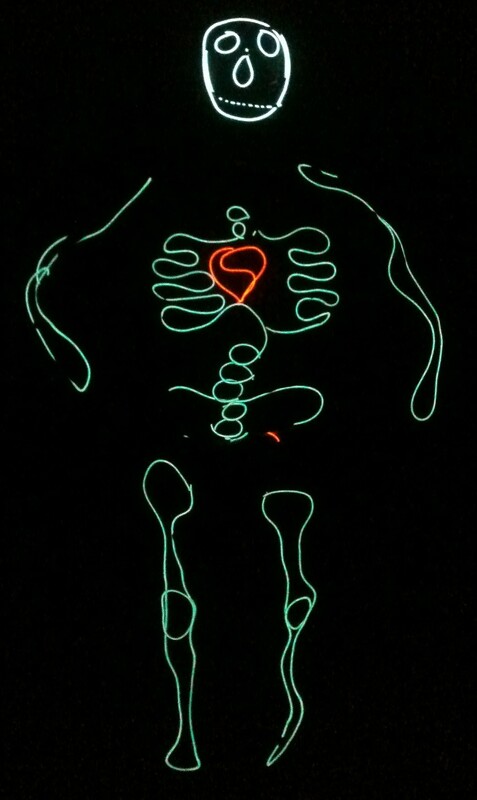 He sewed it with fishing line for durability and kept the cool neon wire loose for easy movement. Thanks for sending us a photo Mike, we love seeing your art.